Since the financial crisis began in 2007, the world’s total current debts (public and private) have increased by over 45% in a 10 year timeframe (source: BIS). About 10 years ago, a series of rolling credit shocks and bank crashes led to the deepest worldwide economic recession for more than a generation. Following the 2008 global financial crisis the world has experienced a decade of sluggish growth and sharp accumulating debt loads. On August 9, 2007, the European Central Bank propped its money markets with billions of euros in emergency cash injections in order to prevent a seizure in the EU banking system after France’s BNP Paribas shut down investment funds hobbled by a U.S. mortgage and asset-backed bond market collapse. Several bank collapses in Britain, the USA, Germany, and elsewhere ensued over the following 18 months. The culmination of the financial crisis was when a 157 year old investment bank in the USA, called Lehman Brothers, was allowed to go bankrupt in September 2008. This whole saga triggered a worldwide financial panic, deep recession, and eventual financial rescue packages launched by the U.S. government, its Federal Reserve central bank, other G20 nations and their subsequent additional unprecedented central bank actions undertaken. Since the 2008 global financial crisis, for the most part governments and their central banks opted to bail out banks and the financial system engaging in quantitative easing (QE) programs which certainly aided many potentially bankrupt banks and their dubious 'mark to model' balance sheets, whilst further indebting government and central bank balance sheets and their citizenries at large. Although credit bubbles and excessive borrowings were the causes of the 2008 financial crash, the attempts to deleverage in this painful recovery have woefully failed globally. In other words, the inputs and conditions that led to the 2008 crisis have not been structurally addressed, rather they have grown and expanded around us since. About 1/3rd of the now $217 trillion in cumulative global debt, has been newly issued since the beginning of the global financial crisis beginning in 2007. In other words, an over 45% increase in total global debts into the summer of 2017. 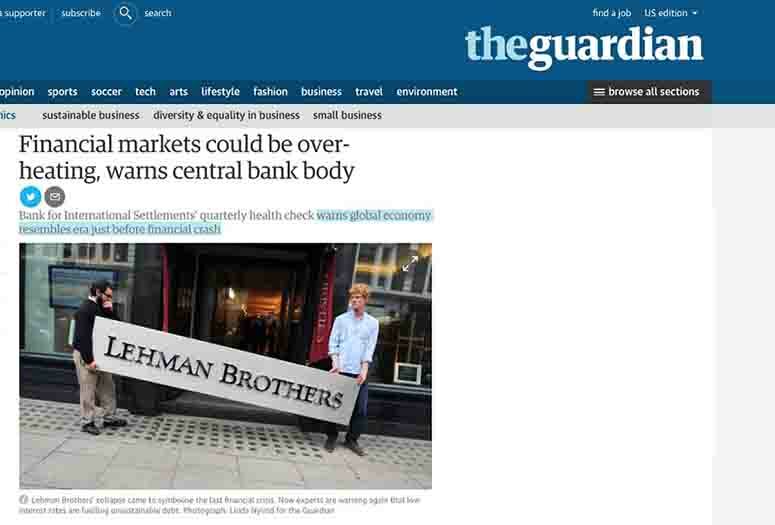 The central bank of central banks (Bank for International Settlements) is now putting out pre-crisis warnings in large financial media spaces echoing the aforementioned points. 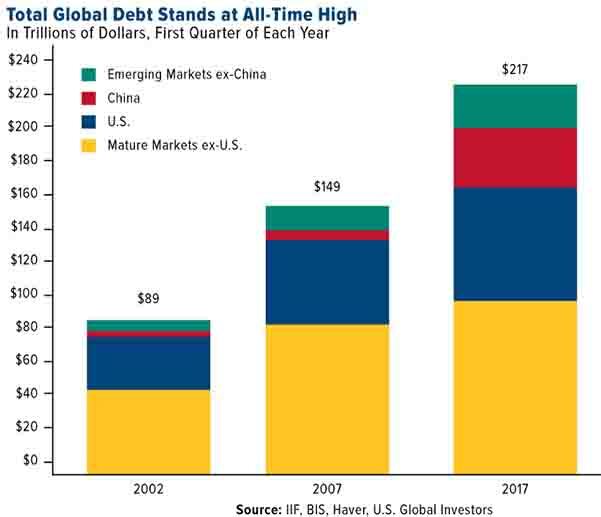 Figures from the Institute for International Finance (IFF) show total global debt has continued to aggressively rise since the 2007-2008 financial crisis and by early 2017 stood at $217 trillion, over 327% of total global (GDP). Since the financial crisis began in 2007, the world’s total current debts (public and private) have increased by over 45% in a ten year timeframe. How sustainable is this? 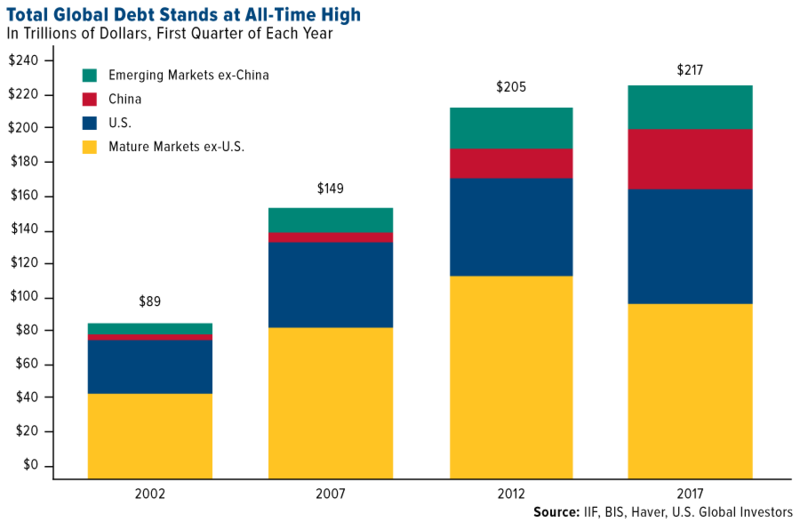 Much of the new debt growth over these past 10 years has come via China’s more than tripling of its M1 & M2 money supplies. None of these aforementioned figures take into account unfunded liabilities and promises made by many western governments either. The USA alone using basic accounting standards (GAAP) has a conservative estimate of over $100 USD trillion in unfunded liability on its hands. Such a large figure is difficult to put into context. If current US unfunded liability was converted into time, in 1 seconds per $1 US dollar, the timespan would last longer than 3,000,000 years. Governments are left with a choice between continuous fiat currency purchasing debasement, further debt expansion and borrowing, or a deflationary depression and economic collapse. Ultimately vast government debts will either be defaulted upon or debased. Average human confidence in the financial system and fiat currencies could falter drastically further. If record low currency velocity somehow sharply reverts and gets out of hand, runaway purchasing power debasement could likely be one of the end results. To conclude the first quarter of 2018, the Institute of International Finance (IIF) published another alarming print on the growing record levels of global debt building (now over $247 trillion USD in total). Of course much of this growing debt pile has been building in emerging markets and especially in China. Growing IOU's and promises to pay don't necessarily mean debt loading entities can actually deliver promised payments. One can expect mass defaults at some point and some varying fashions to come. 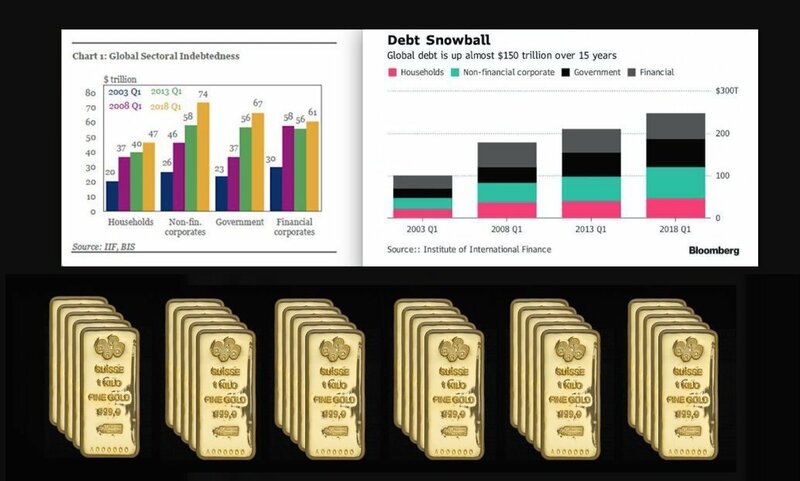 As the world continues to leverage debt and currency payment promises on a limited supply of real underlying wealth and tangible assets, perhaps now more than ever is time for a prudent bullion allocation with physical precious metal products.